February 7, 2019 – Vancouver, BC - Goldplay Exploration Ltd. (TSXV: GPLY, FRANKFURT: GPE, OTCQB: GLYXF) (“Goldplay” or the “Company”) is pleased to announce the completion of an independent NI 43-101 mineral resource estimation (“Mineral Resource”), for the San Marcial Project, located in Sinaloa, Mexico. 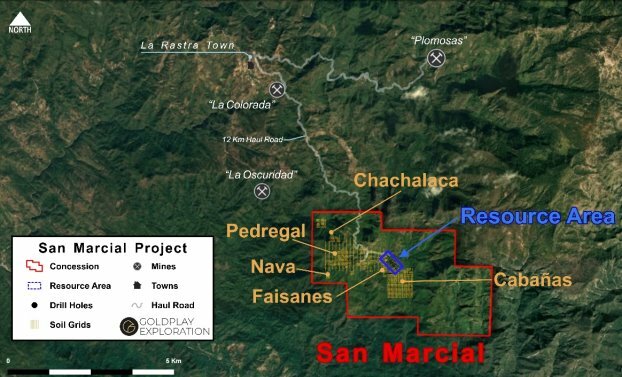 Goldplay’s maiden San Marcial Mineral Resource is a substantial increase from the historical resource completed by Silvermex Resources Inc. in 2008 (“Historical Resource”)1 and reported by Goldplay on 18 April 2018. The Mineral Resource consists of 36 million ounces (“Moz”) of silver equivalent (“AgEq”)2 at an average grade of 147 grams per tonne (“gpt”) AgEq in the Indicated category and an additional 11 Moz AgEq at an average grade of 99 gpt AgEq in the Inferred category, using a 30 gpt AgEq cut off for open pit and 80 gpt AgEq for underground resource classification completed by WSP Canada Inc. on February 07, 2019. The Mineral Resource includes 22 core drill holes (assayed during 2018) in addition to the 30 core drill holes that were used to estimate the Historical Resource in 2008. See Resource table later in this report (Table 2) for additional details. - Increased continuity of the mineralization along strike as well as down-dip, delineating a continuous ore zone along the 500 m strike. Both the Breccia and surrounding Stockwork Zones outcrop at surface. Significant surface exposures of the mineralization support the potential for future definition of an open pit amenable Ag-Zn-Pb mining project. Goldplay retained the services of WSP Canada Inc. to complete the 3-D modeling and independent NI 43-101 Mineral Resource estimation for the San Marcial Project. In doing so, the Company has delivered a material increase in the tonnage, grades and ounces of Ag in the Mineral Resource with the addition of 22 holes to the previous model, for a total of 52 drill holes. - Total silver equivalent ounces, Indicated Resources, increased 57% to 36 million ounces. - Total silver ounces, Indicated Resources, increased 59% to 29 million ounces. In order to define a reasonable prospect of economic extraction, the Mineral Resource was contained within a Whittle optimized pit shell that uses an average Ag price of US$18.5/oz, Zn price of US$1/lb and Pb price of US$0.82/lb. These metal prices are based on a comprehensive survey of commodities forecasts among most prominent commodity experts. The assumed recoveries are based on average recoveries of 89% Ag, 80% Zn and 95% Pb. Operating costs are based on similar existing or nearby operations. For the portion of the Mineral Resource not deemed amenable to economic open pit extraction, the Company has assessed the reasonable prospect of economic extraction in an underground context. 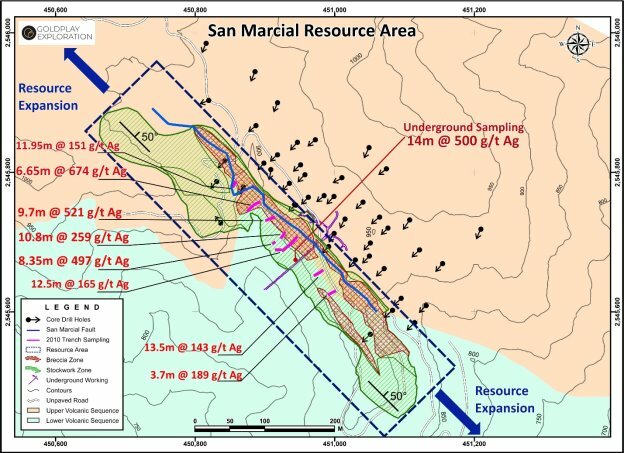 The San Marcial Mineral Resource has been estimated along a 500 m strike length which makes up part of a 3.5 km long mineralized zone, supporting potential for resource expansion (Figure1). As recently announced, the Company continues to advance surface exploration at the San Marcial Project, focusing on five targets recently identified by soil and rock geochemistry (News Release dated 18 January 2019). These targets are yet to be drilled and are located in the vicinity of the Mineral Resource. Goldplay has already received drilling permits to advance a significant drilling program in 2019. The Mineral Resource estimated for each resource category - Indicated or Inferred - is displayed in Table 2, at different AgEq gpt cut off grades. The Effective date for the mineral resource is February 07th, 2019. A Technical Report prepared in accordance with National Instrument 43-101 – Standards of Disclosure for Mineral Projects (“NI 43-101”) will be filed on SEDAR at www.sedar.com within 45 days of this release. 2 AgEq is based on long term silver, zinc and lead prices of US$18.50 per ounce silver, US$1.10 per pound zinc and US$0.95 per pound lead. The following average metallurgical recoveries are assumed as 85% silver, 85% zinc and 95% lead. A 30 gpt AgEq cut off for open pit and 80gpt AgEq for underground resource classification completed by WSP Canada Inc. on February 06, 2019. OP is amenable for potential open pit development, UG is amenable for potential underground development. The Mineral Resource has been estimated by Marcelo Filipov, P.Geo of WSP Canada Inc. and Todd McCracken, P.Geo of WSP Canada Inc. Both Mr. Filipov and Mr. McCracken are Qualified Persons as defined by National Instrument 43-101. The Mineral Resource has been classified in accordance with CIM Definition Standards for Mineral Resources and Mineral Reserves, adopted by CIM council, as amended. Mr. Filipov and Mr. McCracken have read and approved the contents of this press release as it pertains to the disclosed Mineral Resource estimate. Goldplay has implemented QA/QC procedures which include insertion of blank and standard samples in all sample lots sent to SGS de México, S.A. de C.V laboratory facilities in Durango, Mexico, for sample preparation and assaying, for every sample with results above Ag >100 ppm (“over limits”), these samples are submitted directly by SGS de Mexico to SGS Canada Inc at Burnaby, BC. Additional sampling and re-sampling of existing pulps and rejects were conducted to assess the variability of grades in the mineralized zone. A WSP Canada Inc. independent qualified person visited the San Marcial Project from Nov 12th to Nov 16th, 2018. Independent sampling was completed in core samples and surface samples for validation purposes. WSP Canada Inc. has reviewed the QA/QC protocols and procedures implemented by Goldplay and results, believing that the database is reliable for estimating the Mineral Resource. Goldplay owns a >250 sq. km exploration portfolio in the historical Rosario Mining District, Sinaloa, Mexico. Goldplay's current exploration focus includes surface exploration and drilling, with a resource update to follow at the advanced-stage San Marcial Project and follow up exploration program at the El Habal Project. The El Habal Project is a drilling stage project. The oxidized gold mineralized zone outcrops along a series of rolling hills with evidence of historical shallow underground mining along a 6 km long prospective corridor. The El Habal Project is located near the historical gold-silver Rosario Mine which reportedly operated for over 250 years. Goldplay’s team has over 30 years of experience with senior roles in exploration, financing, and development in the mining industry, including over ten years of extensive exploration experience in the Rosario Mining District, leading to previous successful discoveries. A current NI 43-101 report on the El Habal Project is filed on SEDAR. This press release contains forward-looking statements and information that are based on the beliefs of management and reflect the Company’s current expectations. When used in this press release, the words "estimate", "project", "belief", "anticipate", "intend", "expect", "plan", "predict", "may" or "should" and the negative of these words or such variations thereon or comparable terminology are intended to identify forward-looking statements and information. Such statements and information reflect the current view of the Company. Risks and uncertainties may cause actual results to differ materially from those contemplated in those forward-looking statements and information. By their nature, forward-looking statements involve known and unknown risks, uncertainties and other factors which may cause our actual results, performance or achievements, or other future events, to be materially different from any future results, performance or achievements expressed or implied by such forward-looking statements. The historical NI 43-101 resource estimate is based on a cut off of 30 g/t Ag for open pit and 80 g/t Ag for underground resource classification completed by Micon International Ltd. for Silvermex on November 5, 2008. The historical resource is based on 4,884 m of drilling in 30 core drill holes completed by Silvermex and previous operators over a strike length of 500 m and vertical extent of 250 m. A qualified person has not done sufficient work to verify and to classify the historical estimate as current mineral resources and the Company is not treating the historical estimate as current mineral resources. Further work must be carried out to verify all historic information before a resource estimate is possible, and there can be no assurance that when established, that any such resource would be economically recoverable. The NI 43-101 was filed on SEDAR on November 21, 2008 under the name of Silver Ore Mining Corporation, the predecessor of Silvermex. Spamprotection Please add 5 and 3. » more news from Goldplay Exploration Ltd.